53051, Hubcap used, 14", 95-97, NISSAN, P.U., SPARKLE SILVER, 6 SLANTED SPOKES. RAISED LOGO IN CENTER, PLASTIC CLIPS & WIRE RING. 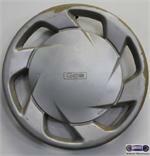 61089, HUBCAP USED, 15", 97-99, TOYOTA, CAMRY. SPARKLE SILVER, 6 CYL. 6 SLANTED SPOKE, CHROME LOGO, 6 PLASTIC CLIPS & WIRE RING.